On May 4, 2015, DIMACS Associate Director Eugene Fiorini was a central figure in what turned out to be a multi-state “crime wave.” The “crimes” were completely staged, but they were serious business for students participating in two different classes on mathematical forensics. 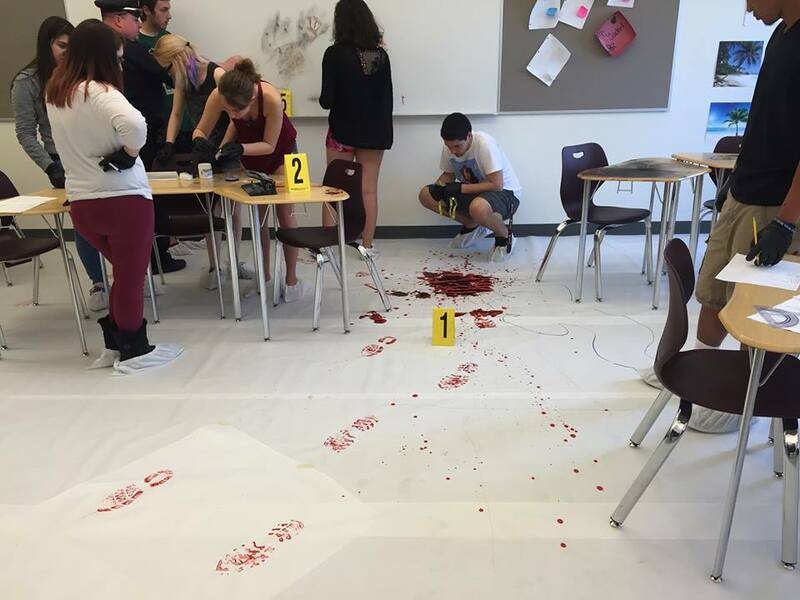 In Ayer, MA, high school teacher Jessie Yackel worked with Detective Andrew Kularski of the Ayer Police Department to teach her students the mathematics behind crime scene investigations. Meanwhile, in Piscataway, NJ, Fiorini was doing the same thing with his honors seminar at Rutgers. 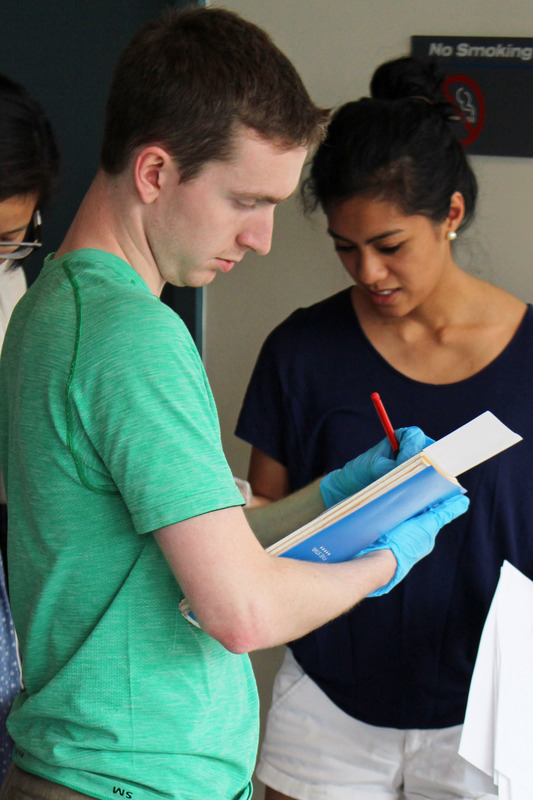 Both classes ended on May 4 with students conducting investigations into the untimely (unsubstantiated and completely untrue) demise of unpopular faculty members. Fiorini taught a course in 2013 that also ended with a tale of murder and deceit in service of teaching mathematical forensics. Evidence suggests that he was at it again. Mathematical forensics is the application of mathematics in forensic science, which, broadly speaking, is the application of scientific methods to gather and analyze evidence for use in a court of law. It turns out that forensic science is fertile territory for mathematical analysis. Basic statistical principles are used in computing body size and gender from measurement of bone fragments or stride length. Time of death estimates can make use of simple algebraic calculations to estimate body temperature over time or can employ more sophisticated methods that apply differential equations based on Newton’s Law of Cooling. Trigonometry and vector analysis are the central tools of blood spatter and ballistic evidence analysis. They help to determine the position of the victim and assailant at the time an attack occurred. Because of popular television shows like CSI: Crime Scene Investigation many of these techniques are already familiar and interesting to students. Most students readily relate to the search for fingerprint matches to a national database, but until they take Fiorini’s class, they probably don’t know that graph theory is applicable to fingerprint analysis. 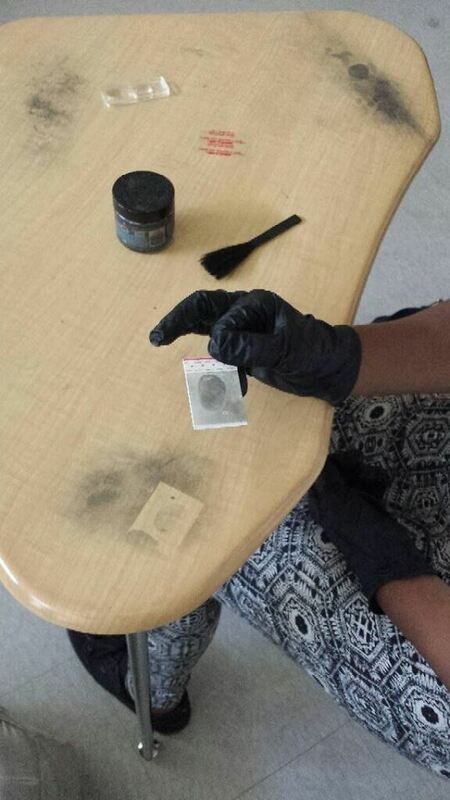 Fingerprints formed by the ridge patterns on fingertips are unique to each individual, making their identification a workhorse in criminal forensics. A coarse classification based on prominent ridge features allows investigators to winnow the database to a smaller set of candidate matches, but it is not enough to make a definite match. To confirm a match they have to rely on a detailed analysis of finer characteristics within the ridge patterns. Fiorini applies concepts from graph theory to identify such characteristics and the relations between them in a “module” on fingerprint analysis that he coauthored as part of the DIMACS project on the Integration of Mathematics and Biology. The module is one of 20 modules in mathematical biology that have been developed through DIMACS projects for use in high school mathematics and science classrooms. More recently, Fiorini has developed another module on blood spatter analysis and time-of-death calculation. The modules are part of a growing portfolio of activities and materials in mathematical forensics that Fiorini has been building and sharing with teachers. In so doing, he has inspired teachers, like Jessie Yackel at Ayer-Shirley High School, to bring the topic to their students. Violeta Vasilevska, a professor of mathematics at Utah Valley University (UVU), is also helping to spread the word about mathematical forensics following an encounter with Fiorini. Vasilevska attended the 2014 Reconnect Workshop on Forensics in which Fiorini was the primary speaker. Inspired by the topic, she and her colleagues organized a conference, “Math and Forensics: Whodunit, Howdunit, Whendunit,” for high school students and teachers held at UVU in May 2015. With 150 registered participants, the conference illustrates the enthusiasm for the topic. 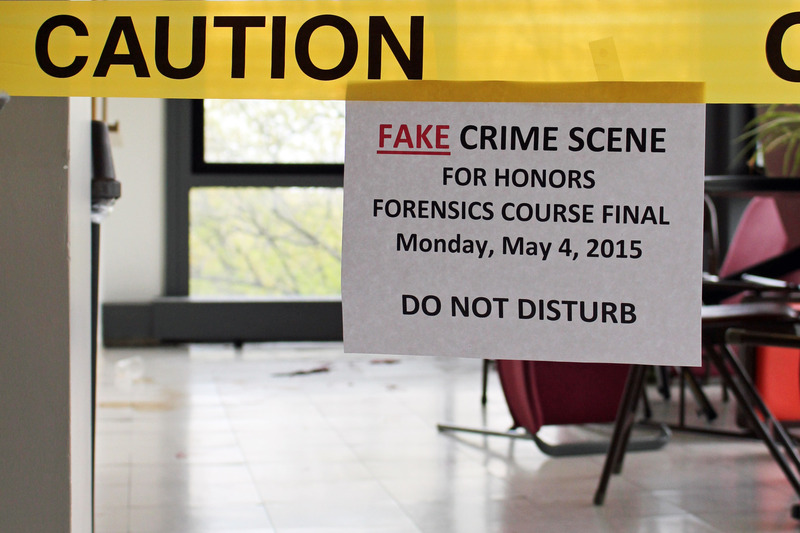 Fiorini’s students are not the only ones to be immersed in the murder-mystery drama of his final exams. DIMACS staff have contributed to the “script”, the fingerprint database, the suspect pool, and alas, played the victim – all in service of education. The crime wave at DIMACS will likely end soon, and the students may have played a role. At the end of the summer, Fiorini will step down as DIMACS Associate Director to return to the classroom. He will join Muhlenberg College as a Professor of Mathematics, where he will inspire students and (most likely) launch future waves of crime and mathematical mayhem. All of us at DIMACS wish him well in this new endeavor and thank him for all he has done during his time at DIMACS. 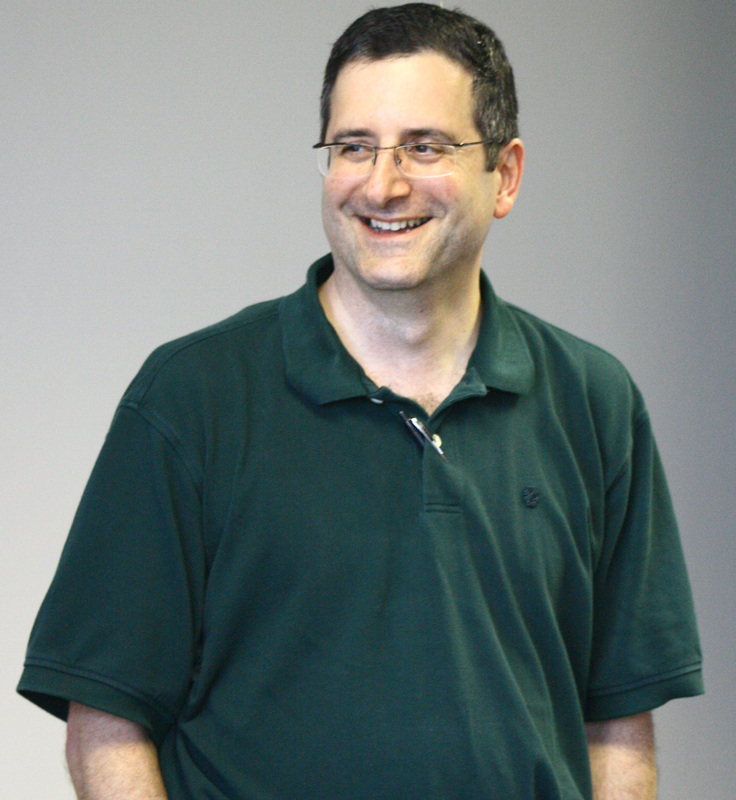 We will miss having him here at DIMACS full-time, but we look forward to continuing to work with him as an active DIMACS member in his new role!